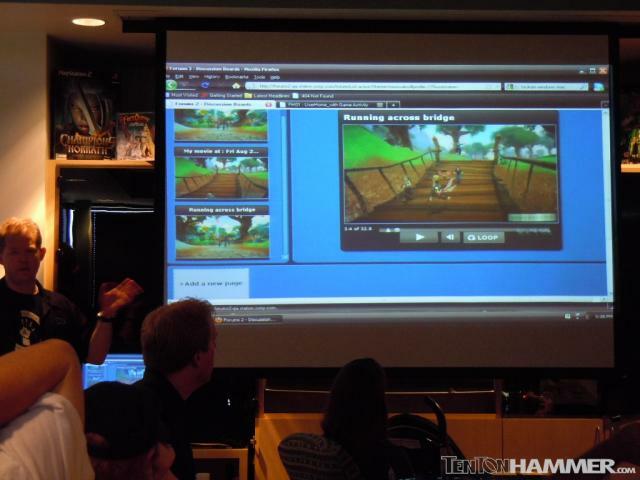 Of all the things that SOE showed us during an extensive studio tour at SyndCon 2010, the non-NDA covered concept that generated the most conversation wasn’t a new game or expansion. 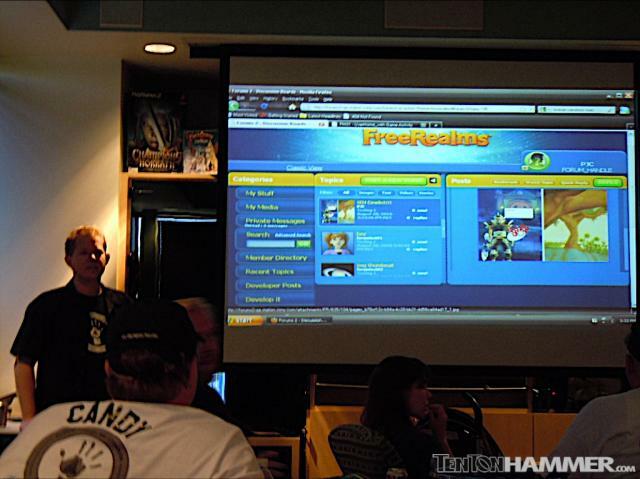 It was SOE’s extensive plans to fundamentally improve on official forums across their growing stable of games. Designer Nathan “Hipshot” Pearce and his team have three prime directives for the project with a working title of “Forums 2.0”. First, SOE is going to great lengths to make the forums multimedia friendly. Spence explained: “Forums haven’t changed in a long time, but the way people communicate has. Back seven to ten years ago, it was heavily text-based. Now people communicate with multimedia and video, so that’s what we’re moving towards… We don’t want to do ‘just text,' text is too boring." To facilitate this kind of interaction without lengthy production chains or uploads, SOE will offer cloud storage of screenshots, in-game video, and audio (for video voiceovers and for the headslapingly new concept of audio posts) in real-time, as well as a built-in video editor. The story editor is an online version of SOE’s surprisingly versatile comic strip editor, and I can see how it will be useful for annotated quest walkthroughs as well as fan fiction and storytelling. Spence noted that the video editor is fairly barebones and isn’t ready for the machinima crowd, but SOE views a more sophisticated video editor as a barrier to entry for the average poster. Aspriring videographers will be able to set ins and outs to trim down their composition, then drag clips to a timeline, and (eventually) add a voiceover, but that’s about the limit. With the story editor and video editor, players can save and edit their work at any time before (or after) posting. When players are finished, they can publish their compositions on the SOE forums, YouTube, and Facebook. “Rich” threads like these get priority on forums listings, as well as a larger post icon. Online storage by the petabyte isn’t cheap, and in an age of microtransactions, we’re always looking for the price tag, but SOE President John Smedley told us not to bother. “This is all going to be free, we’re doing this Google style. There will be limits, realistic limits, because it’s all free." Second, the forums must be character relevant. Spence noted that the forums will be character relevant, meaning that the forums will be aware of things like the class, level, server, and faction of the character you’re posting as and deliver a landing page full of posts pertinent to you, along with updated threads that you’ve recently posted in. Third, SOE is hoping to get rid of the “drilling paradigm.” Spence explains: “For the last 10 to 12 years, forums have been category based – you go down three levels, up three levels, then down three levels to find what you want. We call that drilling, and drilling is a bad user experience.” Make no mistake, as the screencaps show, categories are still in on the lefthand side. From what we gather though (and the details are still being hashed out), the categories will respond to your account’s unique characteristics. Practically speaking, it sounds like SOE has their work cut out for them, but we saw a functional prototype of the reenvisioned 3 column layout in action The left column offered a number of tools and basic navigation / submission links. 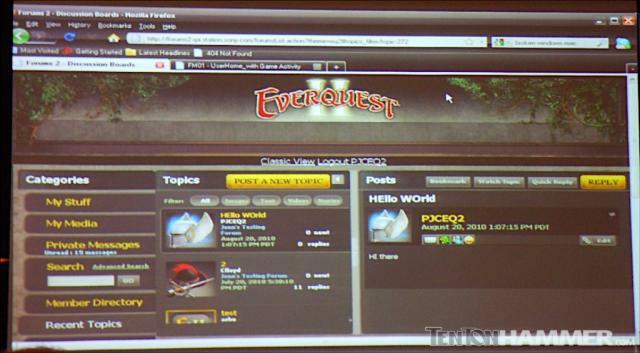 The middle column contained a long list of suggested forum threads. To avoid the massive pagination that would naturally occur with a long list, SOE will implement “infinite scrolling” – a scrollbar that grows in scale as a reader scrolls downward. From this list, players can “dogear” threads that they find of particular interest, and dogeared threads appear in the right-hand column. This allows forum dwellers to compartmentalize their experience by plotting out a few threads to read and respond to. A blue mark in these threads denotes that a developer has posted in the thread, and clicking on this mark allows players to jump quickly to the dev comment. And if the grammar hounds still aren’t sold on the feature set, I’ve got three glorious words: built-in spellcheck. From there, it’s clear that the SOE team is anxious to deploy forums 2.0 for older games like EverQuest II and Vanguard, but also upcoming games like DC Universe Online. Eventually, this will be a Station level service: “Any SOE game you’re a part of, you can jump to without re-log in, ” Spence explained. Whether you’re an avid forumite or just find your way to oboards occasionally via a search engine, you have to respect the intent. SOE is out to deliver a more robust, targeted forum experience that may mean less scanning and more participating. The good news for everyone is that it’s not just a wireframe mockup: Forums 2.0 demonstrably works. Whether it works for the forum community at large remains to be seen.